Boil spaghetti, drain, then place back in saucepan. Add the minced garlic, cream and pesto and mix together. In loose bottomed tin add the spaghetti mix. cover with the cheddar mix and parmesan. Bake in the oven for 35 minutes at 170 degrees. In a bowl mix together the mince beef and all the other burger mix ingredients until fully combined. Then heat a tsp of oil in a frying pan and divide the burger mix in half and create two thin circular burgers and fry until cooked through. 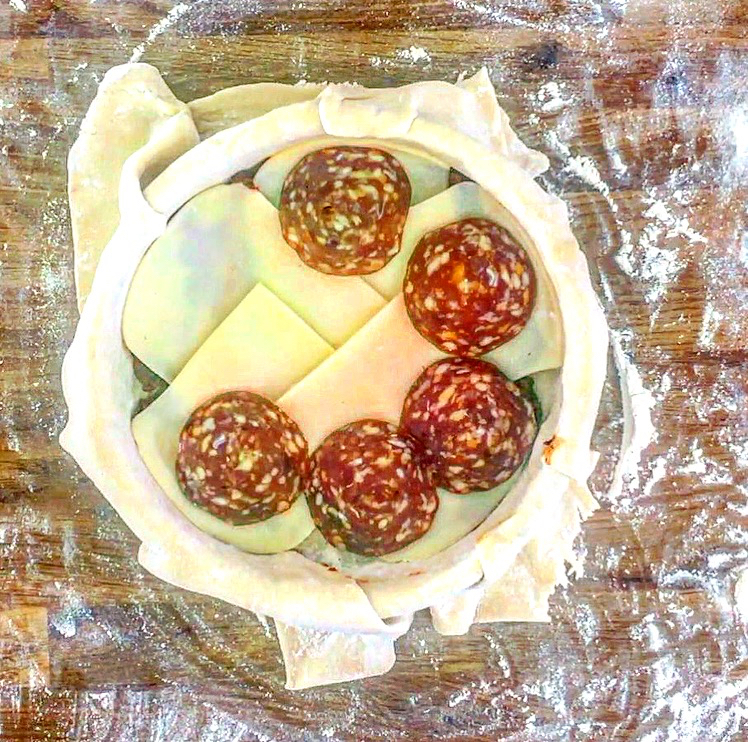 Line a pie tin with short crust pastry. 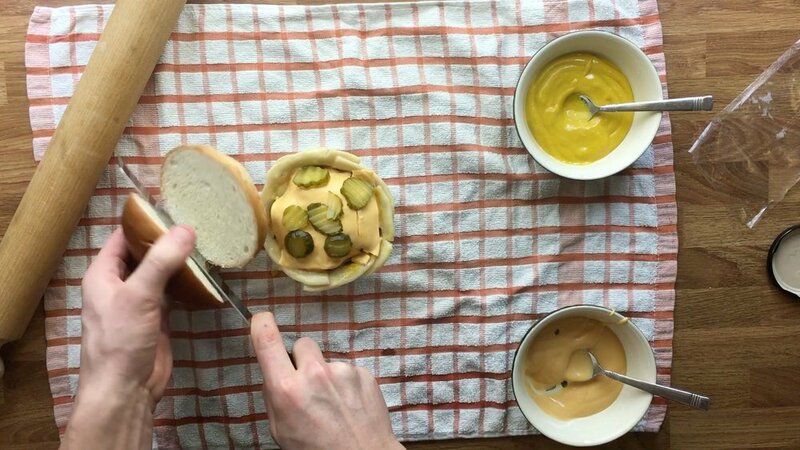 Place the first burger in the base, cover with the american style mustard then place the mozzarella slice on top. Place the second burger on top and cover with burger sauce and place the cheese slice on top. Place the crinkle cut gherkins on top. Egg wash around the edges of the pastry. Take a brioche bun and cut in half. Take the top half and place on top of the gherkins and seal the pastry edges to the bun. Egg wash the top and sprinkle with sesame seeds. Place in the oven for 25 minutes at 170 degrees. For you “cheese mix” places 900g of diced tofu into a food processor with all other ingredients and blend into a smooth paste. Quickly wash out the processor and add the walnuts and the remaining ingredients for the nut mix and blend until a thick dry pasta. In a frying pan cook 600g of diced mushroom, ones they have shrunk in size and most of the water has evaporated, create a space in the middle to cook the onion. After 5 minutes add the nut mixture and stir together. Cook through for 5 minutes and leave to cool. Line a loose bottom tin with the courgette, overlapping where you can. Once the whole area is covered begin your first layer of the tomato and basil sauce. Add your first layer of Free From Lasagne. Then top with the “cheese mix” then a layer of the nut and mushroom mix. Top with the tomato sauce then another layer of lasagne. Repeat one more time. Then on the top layer of the Lasagne sheet add the cheese mix and tomato sauce and mix together. Sprinkle with fresh basil and cover with foil and put in the oven at 180 degrees for 30 minutes. After 30 minutes remove the foil and place back in the oven for 5 minutes. Remove and leave to cool for 5 minutes and serve. Get out your pastry from the fridge 10 minutes before use. Then roll out the pastry on a floured surface and in the centre place a bed of caramelised onion, lay on top the sausage meat and create a funnel through the middle. Place in the funnel the cheese slices and cover with the remaining sausage meat mixture. Beat an egg and egg wash around the edges of the pastry. Fold over one side on top of the sausage mixture, then fold the other side over so they are overlapping. Fold the ends in flip over and place on a baking tray lined with grease proof paper. Egg wash the pastry (add beer if you'd like to the egg wash), and then decorate how you'd like. Place in the oven at 180 degrees for 30 minutes or until nicely golden brown. For the pizza sauce: In a Frying pan add the olive oil and the diced onion, garlic, oregano, parsley. Cook for 1 minutes, add tomato puree and cook for another 2 minutes. Add the tinned tomato and cook for 10 minutes and season. Leave to cool. Get out your pastry from the fridge 30 minutes before use. Then roll out the pastry and place in a loose bottomed tin, making sure you press out to the edges. Put a layer of the pizza sauce at the bottom, top with a layer of mozzarella and then the peperoni. Use a tortilla to separate the layers and begin layer number 2. Create the same base as above (pizza sauce and mozzarella) and then use the sweet chilli chicken and pepper. Again separate with a tortilla. For the final layer repeat the same base as above then add your mushroom and ham hock. Egg wash around the edge and cover with ready to roll puff pastry. Use a fork to seal the edges and then use a knife and run along the side to trim off any excess pastry. After 30 minutes remove the foil and place back in the oven for 10 minutes. Serve with a sprinkle of parsley or basil. In a Bowl mix olive oil over the chicken and add the paprika, cumin, salt and pepper. Place in a large frying pan and cook until nicely browned. Remove chicken and place onion in the pan, cook for 5 minutes and add garlic. Cook for a further 2 minutes and add oregano, chilli powder and cayenne pepper. Cook for 1 minute and add chopped tomato and black beans and cook for 10 minutes and season to taste. Remove from the pan and leave to cool. 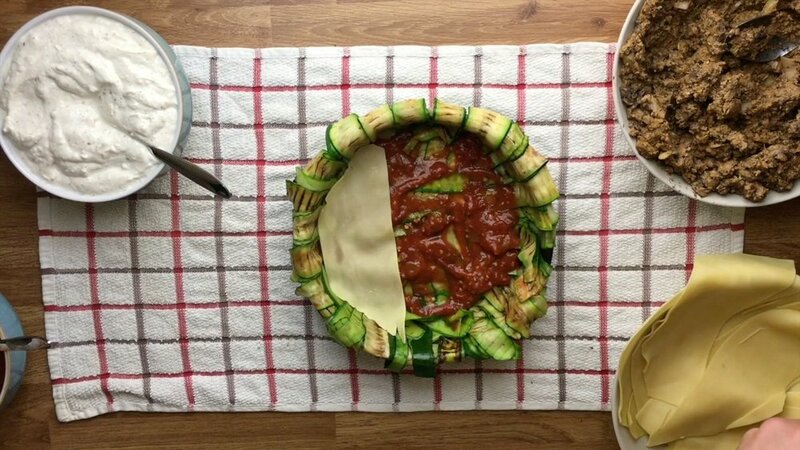 In your cake tin, place three tortillas in the pan and spread around so none of the tin is exposed and just less than half of the tortilla is poking above the rim. Add your first layer of rice and mozzarella. Add another layer of tortilla and place the bean mix on top. Add another tortilla and place your chicken mixture on top and sprinkle cheddar cheese on. Add your final tortilla, fold over your original tortilla that are poking out the top. Cover with foil and bake for 30 minutes at 180. Remove from oven. Remove foil and add a layer of salsa on top and then cover in mozzarella. Leave uncovered and put back in the oven for 15 minutes at 180. Remove and serve with coriander sprinkled on top and a wedge of lime with sour cream and guacamole. NOTE: if you want that stringy mozzarella affect then slice a whole a ball of mozzarella up and place on one of your layers.